The first offical large format plan of Washington D.C.! Plan of the City of Washington in the Territory of Columbia, ceded by the States of Virginia and Maryland to the United States of America, and by them established as the Seat of their Government, after the year MDCCC. This is Andrew Ellicott's seminal 1792 official large format plan or map of Washington D.C., which would become, 8 years later, the capital of the United States. This is the grandest and most beautiful founding official plan of Washington D.C. The map illustrates the original urban layout of Washington D.C, then only a small part of the District of Colombia. Centered on the confluence of the Potomac and the Eastern Branch (Anacostia) Rivers, the map covers the Washington D.C. grid as far north as W Street. It also includes the older nearby city of Georgetown. The District of Columbia was created by the Residence Act of 1790, in which a 10-mile square parcel of land was partitioned off from Virginia and Maryland to establish a new city as the seat of the U.S. Federal Government. When this map was drawn, the national capital was still in in the planning stages and most of what can been seen here was not yet developed. In fact, as of this map's issued date, 1792, Washington D.C. was little more than a fetid swamp. George Washington engaged the French engineer, artist, and urban designer Pierre Charles L'Enfant (August 2, 1754 – June 14, 1825) to design the new capital. It was L'Enfant who laid out Washington D.C.'s iconic ray and grid street pattern. Ellicott, a well-respected American surveyor, was, in the meantime, hired on the recommendation of Thomas Jefferson to survey the boundary of the District of Columbia. While completing his project, Ellicott worked closely with L'Enfant, creating a vision of a grand capital on the European model, with large boulevards, public plazas, and dramatic vistas. L'Enfant and George Washington had a falling out in February of 1792 over the printing of L'Enfant's plan. L'Enfant was fired and, in a fit of anger, refused to turn over his completed plans. 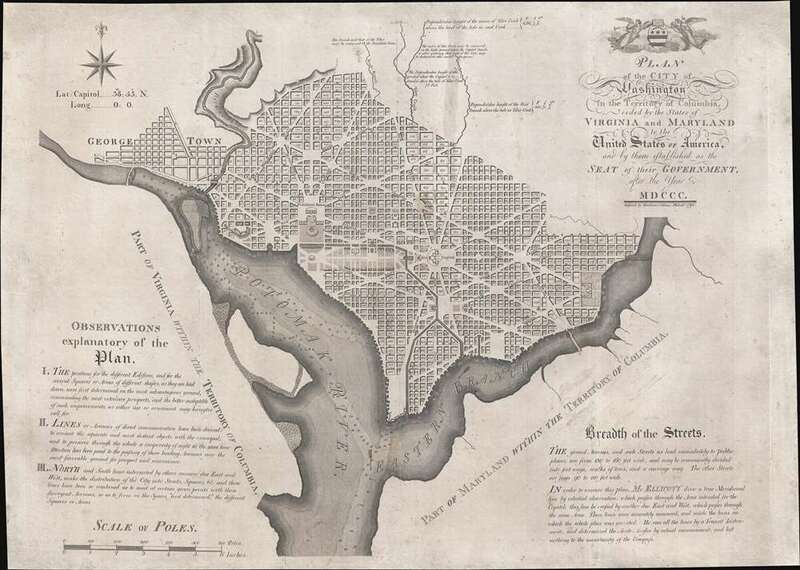 Washington turned to Ellicott, who having worked closely with L'Enfant, was able to produce a close variant of the L'Enfant design, this map, which was ultimately used to construct the national capital city. It is of note that L'Enfant's name appears nowhere this map and Ellicott takes all credit for the design, a clear slap in the face to the brilliant and temperamental Frenchman. Ellicott forwarded his competed plan for the city of Washington to two separate printing firms: the young firm of Thackara and Vallance in Philadelphia, and the more established Boston firm of Samuel Hill. The engravers were instructed to prepare and publish the plan with the greatest possible expediency. The city planning commission intended to use the map to sell off the lots (which are here numbered), thus raising funds and accelerating development of the city to meet the proposed 1800 government move-in date. Knowing that engraving the large official plan, this map, would take time, both firms immediately issued a smaller format version of the Washington Plan. The Thackara and Vallance reduced plan was issued in the The Universal Asylum and Columbian Magazine, which was run by James Trenchard, Thackara's father in law, Hill's version in the Massachusetts Magazine. Nine months later, in the fall of 1792, both engravers finally issued the official large format plan – this very map. The Thackara and Vallance plan and the Hill Plan are notably different. The Hill plan is smaller and the engraving more rushed and amateurish. The presently offered Thackara and Vallance edition is significantly larger, masterfully engraved, and beautifully presented – with certainty the grandest founding plan of Washington D.C and a rare opportunity to the motivated collector. Scarce on the market. Andrew Ellicott (January 24, 1754 – August 28, 1820) was an American cartographer, surveyor, and statesman active in the late 18th and early 29th centuries. He is best known for his work surveying the boundaries of Washington D.C. and completing Pierre Charles L'Enfant's plan for said city. Ellicott was born to a Pennsylvania Quaker family in Buckingham, Bucks County. He was educated at the local Quaker School where he exhibited an early aptitude for mechanics and mathematics. In 1770 his father, Joseph Ellicott (1732–1780), and uncles Andrew Ellicott (1733 – 1809) and John Ellicott (December 28, 1739 – December 28, 1794), purchased land on the Patapsco River with where they relocated and established a milling business, naming the town Ellicott Mills, today's Ellicott City, Maryland. With the outbreak of the American Revolutionary War, Ellicott joined the Maryland Elk Ridge Battalion as a commissioned Lieutenant. During the course of the war he reached the rank of Major, which he maintained as an honorific even after the war. From 1791 to 1792, at the request of then Secretary of State Thomas Jefferson, Ellicott began to survey the boundaries of the newly established District of Columbia. During this same period, he also surveyed, with French urban planner Pierre Charles L'Enfant (August 2, 1754 – June 14, 1825), the future city of Washington, which then occupied only a small potation of territory reserved for the District of Columbia. In February of 1792 the Commissioners had a falling out with L'Enfant after which L'Enfant refused to submit a copy of his plan for Washington D.C. Ellicott, being familiar with Ellicott's methods and style, completed the plan, creating thus the plan upon the nation's capital was subsequently built. In additional to his work in Washington D.C., Ellicott laid out the plan for the city if Erie, Pennsylvania and from 1796, worked on the Spanish-American border in the Gulf Coast, establishing Ellicott's Line, the modern-day border between Alabama and Florida. In 1803 he mentored Meriwether Lewis, one of the leaders of the Lewis and Clark Expedition, on field survey techniques. From 1813 he taught mathematics at the Military Academy at West Point. The final significant survey he completed was the resurvey of the Collins-Valentine Line between Quebec, New York, and Vermont. Three years later he died from a stroke at West Point. John Vallance (1770 – June 14, 1823) was a Philadelphia based engraver active in the late 18th and early 19th centuries. Vallance was born in Glasgow, Scotland. Some scholars claim he apprenticed under Philadelphia engraver James Trenchard, but the dates don't work, as Vallance moved to the United States at 21, already an master engraver. At 21, in the year 1791, Vallance moved to Philadelphia and immediately partnered with James Thacakara, his wife's (a Trenchard?) uncle, establishing the imprint of Thackara and Vallance. The firm completed numerous significant cartographic projects, including maps for Andrew Ellicott, John Melish, Henry S. Tanner, and Reading Howell. Vallance later partnered with Henry Schenck Tanner (1786 - May 18, 1858) and Francis Kearney, forming Vallance, Kearney and Co. Vallance, working with Thackara, produced some of the most important early maps of Washington D.C., engraved early Continental Currencies, and worked on Dobson's Encyclopedia. In addition to his cartographic work, Vallance was also one of the f.ounding members of the Philadelphia based Association of Artists in America. James Thackara (March 12, 1767 – August 15, 1848) was a Philadelphia based engraver. Thackara was born in England, the son of a sailor, and in the year of his birth, the Thackara family moved to Philadelphia. In Philadelphia, he apprenticed under Robert Scott and James Trenchard (1747 - ?? ), whose daughter he married. As early as 1792 he became the partner of his nephew-in-law, John Vallance, publishing maps, bank notes, and prints under the imprint of Thackara and Vallance. Together they are credited with numerous cartographic projects, including maps for Andrew Ellicott, John Melish, Henry S. Tanner, and Reading Howell. Thackara curated the Pennsylvania Academy of Fine Arts from 1816 to 1828. In 1832, he created a new partnership, this time with is son, William Thackara, printing as Thackara and Son. In addition to his engraving work Thackara curated the Pennsylvania Academy of Fine Arts from 1816 to 1828. He also served as an elected Philadelphia City Commissioner in 1797 and was a clerk of the Pennsylvania House of Representatives form 1807 – 1810. Very good. A few minor spots of verso reinforcement and expret repairs to a couple of closed tears. OCLC 1027085845. Phillips, (America) p. 1002. Wheat, J.C., and Brun, C. F., Maps and Charts Published in America before 1800; a Bibliography, #531. Buehler, M., Toward a National Cartography (at americanmapmaking.com), #3. Miller, I., Washington in Maps, p. 44.